Language: Uyghur. The official language is Chinese. East Turkestan is represented at the UNPO by the World Uyghur Congress (WUC). They were a founding member of UNPO in 1991. East Turkestan is a large, sparsely populated area, covering 1. 6 million km². It accounts for more than one sixth of China's total territory and a quarter of its boundary length. Located in Central Asia, it is bordered by Russia in the north, Kazakhstan, Kyrgyzstan and Tajikistan to the west, Afghanistan to the southwest, Pakistan, India and Tibet to the south, China to the east and Mongolia to the northeast. 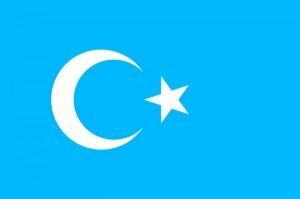 The name “Turkestan” is a Persian word, meaning “land of the Turkic peoples” and dates back to the 5th century. The western part of Turkestan was gradually conquered by the Tsarist Russia in 1865, after which it became known as Western Turkestan. After the formation of the Soviet Union in 1924, the Western Turkestan was divided into five republics: Uzbekistan, Kazakhstan, Kyrgyzstan, Turkmenistan and Tajikistan. The eastern part of Turkestan had been invaded by the Manchu rulers of China in 1876, and was named East Turkestan. It is the cradle of Uyghur history, culture and civilization. The number of people living in East Turkestan is a matter of considerable debate. No satisfactory census of population has ever been made. According to the latest Chinese census the present population of East Turkestan is slightly over 19 million. Of that they state Uyghurs make up 9 million, Chinese 7 million, Kazaks 1.5 million, Kyrgyz 170 thousand, Hui 800 thousand, Mongols 170 thousand, Manchu 22 thousand, Xibe 40 thousand, Tajik 40 thousand, Uzbek 15 thousand , Tibetans 6 thousand, Tatars 5 thousand, Dagur 7 thousand, Russians 10 thousand, other smaller groups 10 thousand. Uyghurs, however, dispute these figures claiming the Uyghur population to be around 20 million. Although East Turkestan is called “Xinjiang Uyghur Autonomous Region” there is no self-rule or self government for the Uyghurs. More than 90 percent of all important political, administrative and economic bodies in East Turkestan are occupied by Chinese employees. For instance, the Regional Party Standing Committee, which is the ruling body of the Regional Party Committee, has 15 members. Only three of them are Uyghurs and ten are Chinese. The same over representation of Chinese is in evidence in the Regional Communist Party Central Committee and the Peoples Regional Government. Several seemingly important positions have been given to Uyghurs, but their authority is consistently undermined. Chinese “Divide and Rule” policies have divided the indigenous peoples of East Turkestan, such as the Uyghurs, Kazakhs, Kyrgyz, Uzbeks and Tatars into separate “provinces”, “counties, and “townships. Population Policies - In order to completely assimilate East Turkestan into China, millions of Chinese are being settled in the region. 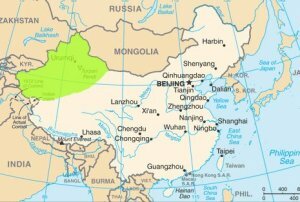 Before 1949 there were only 300,000 Chinese in East Turkestan. According to the Chinese statistics now it is 7 million. Almost 250,000 Chinese have been settled in East Turkestan every year, and contrary to the “one child” policy in existence until recently across mainland China, Chinese settlers in East Turkestan are allowed to have more children. At the same time, coercive birth control is being carried out among the Uyghur women to restrain the growth of Uyghur population. Chinese officials have recently started offering financial incentives for inter-ethnic marriages between Chinese, Uyghur and other minorities. Mixed race couples would be granted privileged access to medical treatment, housing and education for their children. Such policy is meant to undermine Uyghur identity and culture in order to further assimilate those that do not conform to Chinese culture. The assimilation policy also aims to marginalize the Uyghur language and religion. Uyghurs with little or no knowledge of Mandarin are excluded from certain jobs with an ever-increasing number of Han Chinese settling in East Turkestan. According to Amnesty International, in the year of 1997 alone, more than 100,000 Uyghurs were arrested throughout the country. Between January and June 1998, hundreds of Uyghurs were detained under suspicion of planning “separatist” activities. Since 11 September 2001, Chinese authorities have intensified the arrests of Uyghurs. In 2005 alone, around 18,000 Uyghurs were arrested and accused of being “separatists”, “religious extremists” and “terrorists”, according to Reuters. Since the July 2009 incident, Chinese authorities have arrested thousands of people and a high number of Uyghurs have been forcibly disappeared. Detained Uyghurs have undergone unfair trials, lacking in transparency, independence and guaranteed due process rights. Throughout 2014 and 2015, there have been frequent incidents of violence, discriminatory detentions and searches of Uyghurs, particularly students and activists. The Chinese Government has conducted nation-wide sweeps, security checks, and detentions carried out by armed security forces, specifically targeting Uyghurs and inciting clashes. In January 2014, Chinese authorities arbitrarily detained a prominent Uyghur professor of economics and a founder of the website Uyghur Online - a platform launched to promote conciliation between Uyghurs and Chinese - Mr. Ilham Tohti, and six of his students, on charges of ‘inciting separatism’ despite his moderate views on self-determination of the East Turkestan region. Tohti was detained by the Chinese Government in January 2014, on initial charges of “inciting separatism” and sentenced to life in prison. His eventual sentencing, following months of questionable conduct on the part of the authorities, was undeniably politically motivated. Moreover, seven of his students were sentenced to up to eight years in prison simply for their association with Mr Tohti. International community condemned Mr Tohti’s detainment, particularly the United States, the UK, Canada, Germany, Australia and Italy. The US State Department considered the arrest as “part of a disturbing pattern of arrests and detentions of public interest lawyers, Internet activists, journalists, religious leaders and other who peacefully challenge official Chinese policies and actions”. Otherwise, however, there has been a regular silence on issues concerning Uyghur rights. The first half of 2014 saw a sharp rise in violence as a result of growing social inequality and oppression. When in detention, Uyghurs are regularly subjected to torture. After visiting detention centers in East Turkestan, Tibet and Beijing, Dr. Manfred Novak, the U.N. Special Rapporteur on Torture, stated that “torture in China is still wide-spread” and groups including Uyghurs and Tibetans “have been targets of torture”. A U.N. statement later said that over the years Chinese authorities have used electric shock batons, whips, hoods or blindfolds, needles and hot oil to torture prisoners alongside other forms of torture, such as sleep deprivation, water submersion and bodily mutilation. The death penalty is extensively used in East Turkestan and the number of death sentences imposed is significantly higher than in the rest of China. Many of those executed have been victims of extra-judicial executions or deliberate killings. According to a CNN report, 1,000 Uyghurs have been executed in East Turkestan in 1997 alone. Between January and September 1998, 55 Uyghurs were executed. Following 11 September 2001, more than 200 Uyghurs were executed on political grounds, while 50 Uyghurs were sentenced to death for so-called “separatist” and “terrorist” activities. According to Reuters and AFP on 17 August 2004, four more Uyghurs were executed. The mass executions that took place in the month of May and June 2014 have caused growing concerns about the lack of justice, due process, and legal guarantees for defendants with Uyghur names. WUC believes that since January 2010, China has secretly sentenced more Uyghurs to death in connection with the July 2009 incidents in Urumqi. The most recent death sentences have been implemented quickly and effectively with no chance for appeal or external scrutiny. There has been no evidence that the suspects were provided any kind of legal defense. Another pressing issue that Uyghurs face in China is the practice of enforced disappearances. The overall situation in East Turkestan deteriorated in the wake of the turbulent unrest in the region, following July 2009 clashes. In its aftermath, hundreds of Uyghurs were arrested and held incommunicado, reinforcing a growing trend of forcedly disappearing people, providing no indication of their whereabouts. Families and friends are unable to locate their loved-one as authorities refuse to confirm their detention or death. In addition, the practice of organ harvesting is considered to be closely linked to enforced disappearances in China, primarily targeting Uyghurs and the Falun Gong, especially in cases of political prisoners. Uyghurs who attempt to flee the repression in East Turkestan are at extreme risk of being deported back. Uyghur refugees and asylum seekers have been forcibly deported from neighboring countries that have strong diplomatic and trade ties to China. According to the World Uyghur Congress, upon their return to China, many are detained, tortured, sentenced to death or disappeared. Forced deportations have also occurred from Kazakhstan, Kyrgyzstan, Uzbekistan, Pakistan, Cambodia, Vietnam, Thailand, Burma and Laos in recent years. As Cambodia forcedly deported 20 Uyghur asylum-seekers including a woman and children to China in December 2009, the Chinese government labeled these Uyghurs as “criminals”. The Chinese authorities refused to reveal the conditions, whereabouts, and legal status of the returnees, despite calls to do so from human rights organizations and the United Nations. Prior to 2011, Uyghurs were repatriated from several states, such as Cambodia, Laos, Uzbekistan, Kyrgyzstan, Burma and Nepal. In May 2011, Ershidin Israel was forcibly deported from Kazakhstan despite having an offer to settle in Sweden. In August 2011, Thailand repatriated one, Pakistan deported five Uyghurs, including a woman and two children, and Malaysia deported eleven Uyghurs. In November 2014, at a UN meeting in New York, Turkish Foreign Minister Mevlüt Çavuşoğlu announced that Turkey had taken the steps to receive the refugees from Thailand, though there has been no definite action taken. In 2015, Thailand deported 100 Uyghurs, drawing international attention and condemnation from the UN, US and EU. A Human Rights Watch press release states that "Uighurs disappear into a black hole after being deported to China.” It continues by elaborating that "China appears to be conducting a concerted campaign to identify and press for the return of Uighurs from countries throughout Asia". The Chinese government is directly implementing a campaign of religious repression against the Muslim Uyghurs. According to a report released by Human Rights Watch in 2005, “the world-wide campaign against terrorism has given Beijing the perfect excuse to crack down harder than ever in East Turkestan. Other Chinese enjoy a growing freedom of worship, but Uyghurs like Tibetans, find that their religion is being used as a tool of control.” According to the WUC, ever-more intrusive controls have been adopted, including surveillance of mosques and the screening of materials produced by religious leaders. Most recently, Chinese authorities have tightened curbs on Uyghurs, banning any government official, state employees, Party members, children, and in some cases women from entering the mosques. At present, the number of mosques in East Turkestan is not sufficient to meet the needs of local Muslims, however, the building of new mosques has been prohibited. There are no private religious schools and private religious instruction is banned. There is a shortage of well-educated clerics, Korans and Islamic publications. Government control of religious activity has even reached the private sphere. Uyghur youths are prohibited from praying or fasting during Ramadan, and to travel to Mecca for the Hajj. Unofficial religious schools, taking place in private houses due to lack of alternatives are also targeted, resulting in arrests and violent intrusion by the police. In 2014, authorities particularly intensified the curbs on Islamic practices among Uyghurs, conducting hundreds of arrests and house-to-house searches and monitoring religious leaders. China’s new law, which came into effect in January 2015, targets religious extremism by further limiting the exercise of religious practice. Local authorities continue to discriminate against Uyghur men with beards and women with headscarves, as both are considered Muslim religious symbols, while most Uyghurs regard it as a marker of their identity. Chinese authorities regularly detain Uyghurs who refuse to comply: 45 men were detained for having a beard and 37 women were sanctioned for wearing veils. The Ramadan of 2015 served as a sad example of China’s crackdown on religious freedom. Chinese authorities in the region have forced establishments, such as shops and restaurants to sell alcohol and cigarettes to attempt to weaken Islam in the region. Uyghur Muslim women are reported to be particularly targeted by police violence. In February 2015, Muslim imams were forced to dance in the streets, swear to oaths and brandish slogans that glorify the state over religion. Later that year, the Chinese authorities have issued a ban on 22 common Muslim names. Female Uyghur have been victims of severe violations of their dignity and individual rights in cases of forceful sterilizations and abortions, particularly, in rural areas. Another issue related to the suppression of Uyghur women concerns numerous attempts to prevent them from wearing headscarves and forcibly change their clothing habits. The government is also implementing a policy that includes transferring young, unmarried Uyghur women to work in southern China – where they are in many cases exploited. Uyghur language schools have been banned, or merged with Chinese language schools, and Chinese has been imposed as the language of instruction. Throughout the country, hundreds of thousands of books written in Uyghur language have been burned. Since the end of 2013, Chinese universities in East Turkestan have obliged students to declare their allegiance to the Chinese Government and to pass a test on political views before being able to graduate. Employment opportunities in cities have been limited for those with no or little knowledge of Mandarin, further excluding a large part of the Uyghur community from the labor force. Due to demographic changes, assimilation pressures, unequal distribution of power and influence, and a general preference to conduct business in Mandarin, there is widespread unemployment among the Uyghur population and it is growing at an alarming state. Despite East Turkestan’s natural wealth, the Uyghur people live more or less at mere subsistence level with almost 80 percent living below the poverty threshold. The rich resources of East Turkestan, including oil, gas, uranium, gold and silver reserves are transported to mainland China. The exploitation of these natural resources is strictly controlled by the Chinese Central Government. Local Uyghurs have no control over these resources; they have no access to information on profits generated by these resources and have no chance to benefit from their own wealth. Moreover, in recent years, Chinese authorities have demolished hundreds of Uyghur enterprises in various parts of mainland China, harassed Uyghur entrepreneurs and deported them to East Turkestan. Uyghurs are discriminated against even when travelling on business around China, and discriminated from staying in top class hotels. International media outlets face huge obstacles in the region. Information is strictly controlled by the State and accurate statistics or reports are hard to come by. Chinese authorities issue incorrect or false information in order to block issues pertaining to East Turkestan from becoming known internationally as made evident in a secret document of the Standing Committee of the Chinese Communist Party. The document, entitled “Defending the Stability of Xinjiang”, adopted on March 19, 1999, briefly states that “…through disinformation, prevent by all means, the separatist forces from making the so-called East Turkestan problem international”. After the July 2009 incidents, Chinese authorities imposed a repressive information crackdown on Uyghurs, leaving East Turkestan completely cut off from the outside world for about ten months, having no functional communication channels available. Since then, arbitrary detentions of Uyghur journalists, professors and writers are common. Among many others, Professor Ilham Tohti has been serving a sentence of life imprisonment since 2014 for his peaceful and moderate stance against China's anti- Uyghur policy and calls for dialogue. Uyghur use of the Internet is also subjected to particular censorship, control and intimidation by Chinese officials. The detention of bloggers and webmasters from East Turkestan is also an alarming reality. In 2015, Mr Zhao Xinwei, a former editor-in-chief of the official Communist Party publication in East Turkestan who had highlighted China’s ruthless policy of silencing alternative voices, was prosecuted on charges of corruption after he "improperly discussed" and "publicly made comments in opposition" to party views on the East Turkestan region. Freedom of movement for Uyghurs in East Turkestan became a serious issue in 2014 as numerous checkpoints and roadblocks have been set up throughout the region for monitoring the whereabouts of Uyghurs. Uyghurs also face problems with passport acquisition and travel restrictions. ID cards are necessary to move from place to place, and an additional green card is required to make purchases. Additionally, the authorities have inspected the content of smartphones held by Uyghurs at the checkpoints. According to WUC, any content showing a mere hint of separatism or sanctioned religious activity can cause an arrest on terrorism charges. International phone calls and email communication are heavily monitored and the Internet is regularly shut down following public unrest. The Chinese Regime's treatment of women in East Turkestan is particularly violent. Women often face forced abortions or are forced into taking shots and pills that will sterelize them. This follows a campaign lead by the Chinese Communist Party aimed at reducing the Uyghur population and replacing it with Han Chinese migrants. The problems faced by Uyghur women increase the importance of women presence in the Uyghur Rights movements. A lot of uyghur women activists are now speaking up for their people back home, and are taking an important role in the uyghur advocacy campaigns. Shahrezad Gayrat, a young and motivated woman, is one of them. Please download our East Turkestan Member profile brochure.